Virus transformations as a consequence of pharmacological pollution in the human body/mind ecological system is a compelling hypothesis based on the data presented in George Vithoulkas's 'A New model for Health and Disease'. It strongly underscores the need to focus on an 'energy' medicine to correct the deficiencies of our present 'chemical' medicine. 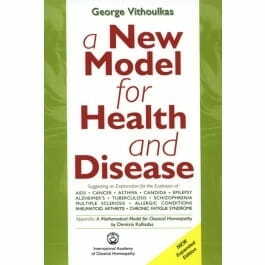 In this long-awaited ground-breaking treatise, theorist and homeopathic teacher George Vithoulkas presents a new paradigm for modern medicine. Established medicine has failed in its mission to prevent or cure many diseases, Vithoulkas asserts, because of the excessive and often needless use of powerful drugs. Western medicine has a limited view of the total organism and the true sources of disease. Vithoulkas relates the increasing incidence of AIDS, cancer, asthma, epilepsy, schizophrenia, Alzheimer's disease, rheumatoid arthritis, and other difficult-to-control illnesses to the weakening of the immune system from over-prescribing of drugs. Only when we fully integrate the role of the psyche, spirit and emotions into our explanations of illness, he says, well we be able to generate a fuller definition of health, and change our conception and methods of treatment.